ICF Malaysia partnered with two local coaching organizations, MACC and ACSM, to produce three ICW events. The ICW week launched on May 14th at the Malaysian Airlines Academy, which was geared towards HR directors and leaders in the Kuala Lumpur community. We had 18 clients and coaches participating from the three coaching organizations. There was an introduction by: Ashley Grandisch – ICW Chair, Wai Kheong Leong – ICF Global Director, Florence Lam – ICF President Malaysia, Rahman Ramli – President MACC, Vimala Suppiah – President ACSM. Certificates of appreciation were provided for all coaches and clients. The second event took place on May 17th at the National Cancer Society. We coached 22 members of their staff. There was an introduction by: Vimala Suppiah – Organizer of the event. Thank you and presentation from The National Cancer Society. The third event took place on May 18th at SIRIM Berhad. We coached 11 of their internal employees. There was an introduction by: Jo Ann NG – Organizer of the event, Thank you from SIRIM, Florence Lam – ICF President Malaysia, Rahman Ramli – President MACC, Vimala Suppiah – President ACSM. volunteer and helped to bring the coaching profession more exposure in the KL community. We had some great feedback from the clients who were being exposed to coaching first time. 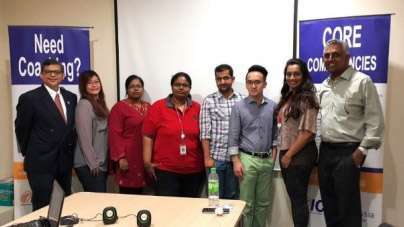 ICF Malaysia conducted a two-hour session about coaching and its benefits for Aramex leaders, as part of corporate outreach during International Coaching Week 2015. Read more about how we helped Aramex on the ICF Global blog.